NORTH NEWTON – Things didn’t look promising for the Kansas Wesleyan women’s basketball team with 4:53 left in the game after the Bethel Threshers took a 53-46 lead on a three-point play by Jade Brown. However, the No. 18 ranked Coyotes turned things around in their favor, using an 11-0 run capped by Courtney Heinen (JR/Axtell, Kan.)’s own three-point play to pull away late for a 63-57 win over the Threshers inside Thresher Gym. “This team absolutely refuses to lose,” KWU coach Ryan Showman said. “This team is player-led and there was just such a calm throughout the game. Brown’s play for Bethel gave the Threshers their biggest lead of the night and the biggest lead either team had in the game before the super-sub Heinen buried a triple assisted by Amanda Hill (SO/Rossville, Kan.) to start the Coyote charge. A bucket by freshman Lauren Flowers (FR/Overland Park, Kan.) pushed the Coyotes within two, and another triple by Heinen put the Coyotes up 54-53 with 3:26 left. It was a lead that would not be surrendered. Heinen’s three-point play with 2:45 left put the Coyotes up four at 57-53. “Great teams, special teams, find ways to win games on the road. Everything was against us, absolutely everything and this team still found a way to win,” Showman said. “We did it by forcing 25 turnovers, pulling down 17 offensive rebounds and winning the rebounding battle. We did it by making free throws and hitting timely shots. “I tell you what, when the game’s on the line you can go down that bench and pick someone and tonight it was Courtney Heinen and Kayla Kivinski (SR/Port Richey, Fla.) hit some huge shots there in the second half,” Showman said. Wesleyan had to operate in the post with a rotation thanks to starter Virja Lewis (SO/Kansas City, Kan.) getting into early foul trouble in the first quarter and finishing with four fouls and no points, while Flowers also had four fouls. All four post players in the line-up saw significant minutes and played well. It was a struggle for the Coyotes opening the game. The Coyotes were just 5-of-19 shooting in the first quarter (26.3 percent) and shot 30.6 percent in the first 20 minutes, but stepped it up in the second half, especially in the fourth quarter, but finished the night shooting 31 percent. Wesleyan fell behind 9-2 to start the game, but pulled back within a point at 12-11 on a free throw by Heinen with 1:04 to go in the first. Heinen’s bucket with 36 ticks left in the first got the Coyotes within two at 15-13 to end the first. A basket by Flowers tied things at 17-all with 8:32 left in the second and after a Bethel bucket, Kivinski hit a 3 to put the Coyotes up briefly at 20-19 with 6:17 left in the half. The teams exchanged the lead the rest of the quarter, and Janai Mitchell (SR/Salina, Kan.) was able to score the final points of the quarter with 2:45 left sending Wesleyan into the break leading 27-26. Bethel took a 32-27 lead to start the third, but the Coyotes battled back tying the game at 32 with 6:12 left on a 3 by Kivinski. Bethel maintained the lead the rest of the quarter, leading by as many as five before another long-ranger by Kivinski got the Coyotes within two with a minute left in the third. Another Kivinski triple gave the Coyotes a brief 42-41 lead to start the fourth before a 12-4 run by the Threshers gave Bethel the 53-46 lead with 4:53 left. Heinen led all scorers with 22 points in the game as KWU had 41 of its 63 points off the bench. Kivinski was the only other Coyote in double figures with 14. Lewis and Sydney Mortensen (SR/Wichita, Kan.) had six rebounds each to lead the Coyotes while Heinen added five as KWU had a 40-39 advantage on the boards. Things don’t get any easier for the Coyotes on Saturday as Wesleyan hosts No. 11 ranked and conference co-leader Tabor at 5 p.m. inside Mabee Arena. The Coyotes will be wearing pink and will be raising funds for the Kay Yow Cancer Fund as part of #Play4Kay activities going on throughout the month. “I’m hoping everyone comes out to Mabee Arena and packs the place with purple,” Showman said. “It’s gonna be a great game but that’s why these kid come to Kansas Wesleyan to play in games like this. This is why you compete in games like this and we are blessed to be in this position. After Saturday’s tilt with Tabor, the Coyotes have two games left in the regular season, at York next Wednesday and then a meeting with the rival Swedes in a First Bank Kansas Smoky Hill Showdown game to conclude the regular season on February 16. NORTH NEWTON – Anthony Monson cut to the chase Wednesday night after watching his Kansas Wesleyan basketball team hang on down the stretch after seemingly having the game well in hand. 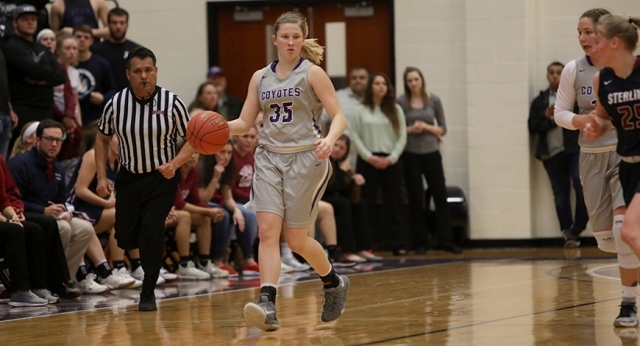 “At the end of the day we found a way to win and I’ll take it,” Monson said of the Coyotes’ harrowing 73-70 Kansas Conference victory over Bethel. Wesleyan escaped with the win after leading 61-43 with just over nine minutes left in the game. Bethel, scrambling to remain in the chase for a berth in the KCAC postseason tournament, came storming back and got within one possession in the final seconds. A Brooks’ offensive foul on an inbounds play with 4.8 seconds left gave the Threshers one final chance. After a time out to set up a final play, Garrett White’s guarded, 35-foot 3-pointer from the right side missed as time expired. The victory was the fifth in a row for Wesleyan, which improved to 16-9 overall and 14-7 in the conference. It also was the Coyotes’ seventh victory in eight games and 10th in their last 12. But their latest conquest wasn’t without ample drama. KWU committed 23 turnovers, the Threshers scored 13 points the final 53 seconds and the Coyotes made just 5 of 11 free throws the final 1:15. Wesleyan outscored Bethel 10-3 the final 3:20 of the first half and led 36-23 at intermission. The Coyotes forced 14 Thresher turnovers the first 20 minutes. Bethel (13-14, 8-13 KCAC) rallied and got within 41-36 with 14 minutes left. A 20-5 run extended the Coyotes’ advantage to 61-43 before the Threshers came charging back. The Coyotes shot 45.6 percent from the field (26 of 57), including 9 of 22 from beyond the 3-point arc, and won the rebounding battle 41-32. Brooks led KWU with a game-high 23 points that included 4 of 10 shooting from long range. He also had five rebounds. Marquis Kraemer (SO/Aurora, Colo.) added 16 points, five assists, four rebounds and two steals, and A.J. Range had 12 points, seven rebounds and four assists. He was 6 of 6 from the foul line. Monson was particularly unhappy with his team’s defensive play the second half. Bethel, which lost its sixth consecutive game, shot 46 percent (28 of 61) and was 8 of 19 from beyond the arc. Terrell Marshall, Clifford Byrd Jr. and White led the way with 13 points apiece. The Coyotes are back in action Saturday at Mabee Arena against conference foe Tabor, starting at about 7 p.m. The Bluejays (7-20, 5-16 KCAC) were idle Wednesday, and have lost three of their last four games and 15 of 18. Wesleyan defeated Tabor 72-59 Jan. 2 in Hillsboro after trailing 28-26 at halftime.